One of the hot spots for new music the last few years has to belong to Brooklyn, NYC. I went there on vacation last year and I swear I never saw so many hipsters in a concentrated area. Tons of young, good looking artsy people. All looking like they were in an indie band and dressed to kill, kinda surreal. Must be pretty inspiring to live in a place like that with so much creativity all around. Anyways I got another new act for you from there. 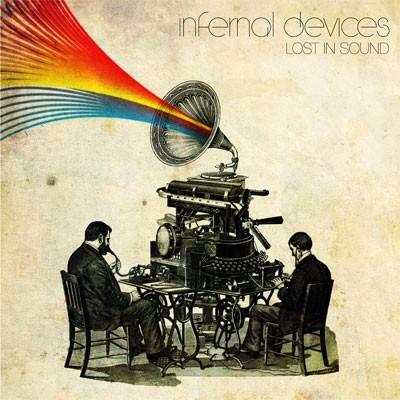 This time in the form of electro-pop duo Infernal Devices. They are getting ready to release their EP Lost in Sound Oct 1st. They sent over the first single from the EP "Fast Enough" as well as a remix they did for Xylos track "Not Enough" and I am digging them both! Dark, catchy, synthy goodness. Check it out below and see what you guys think. If you dig these and want more, their EP will be available Oct 1st on their site here for only $4. Shortly thereafter at online retailers like iTunes/Amazon. Keep up the good work guys!